There are two versions of the Character Options Sorting Office Playset – the Mini SDS Sorting Office and the larger deluxe playset. This Sorting Office is the deluxe Sorting Office Playset featuring the various parts of Pat’s all new SDS Sorting Office. This playset incorporates many interesting features. The Sorting Office moves parcels along a conveyor. The parcels can be passed through an x-ray machine before being sorted ready for delivery. The playset even has a lift to move Pat and Jess up to their landing pad. 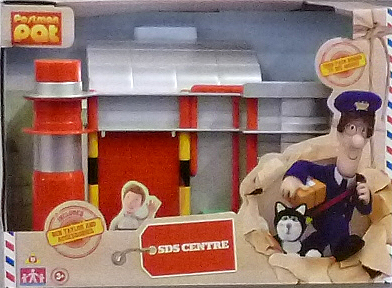 The Postman Pat Sorting Office Playset comes with accessories and figures of Ben and Jess. 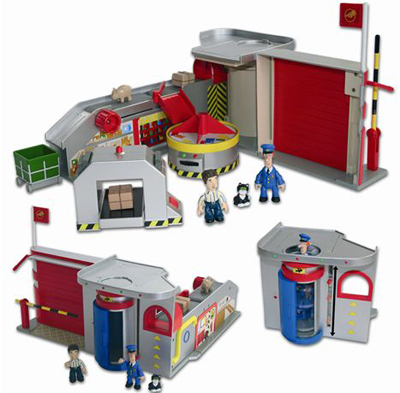 The Sorting Office is one of those Postman Pat toys that every Postman Pat fan will want to own. 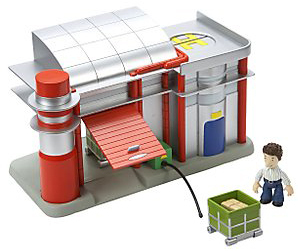 The Mini SDS Sorting Office Playset features the main roller door entrance to the SDS Sorting Office and includes the Ben figure with a post trolley. In 2013 this set was repackaged and called simply ‘SDS Centre’.